Speak Out is a wacky word game where players fit plastic mouthpieces into their mouths and attempt to utter phrases for their teammates to guess. The phrases will end up coming out garbled, similar to the phrases used in Mad Gab, and much of the fun of the game is simply trying to guess the mangled phrases, even if you guess wrong. Players compete for cards, and the team that ends up with the most cards wins. The game is designed to be played with two teams of at least two players each. Decide who will go first, and then the first player of the first team inserts their mouthpiece and draws a card from the deck. When ready, flip over the timer and begin the round. 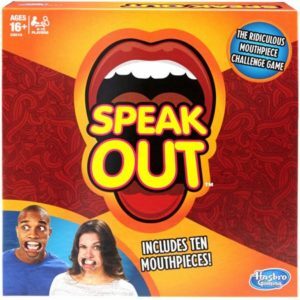 The player wearing the mouthpiece attempts to say the phrase on the card that they drew. Hand movements are okay, but no pantomiming is allowed. You may repeat the phrase as many times as necessary to get your team to guess the phrase. Once guessed, you win the card. According to the Speak Out rules, a player may opt to pass on a card, but the card is then awarded to the other team. Once your team guesses the phrase, draw another card and continue the process until time runs out. Each phrase that your team guesses awards you with the card that contained the phrase. After all players on both teams have gone twice, the game ends, and the team with the most cards wins. ← LCR Rules: How Do You Play the LCR Dice Game?